Huffin Puffins (also formatted as Huffin' Puffin) are chubby birds that appear in the Yoshi franchise and in Mario Party Advance. 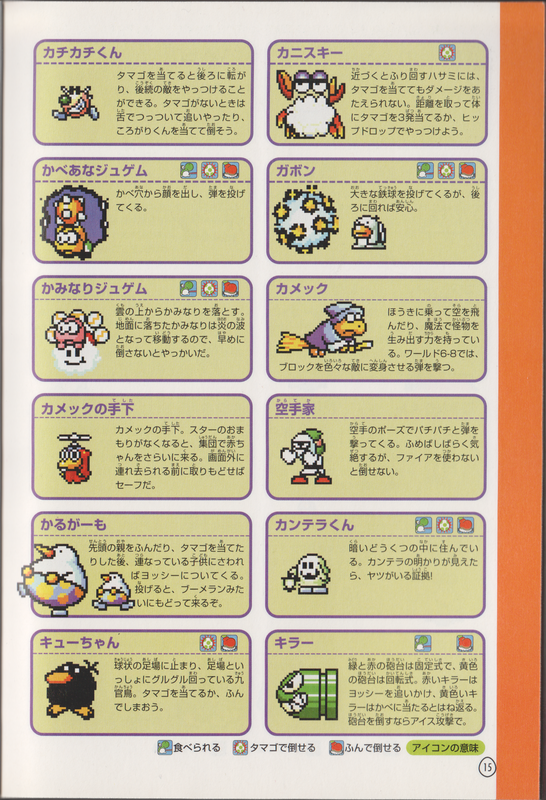 In Super Mario World 2: Yoshi's Island and Yoshi's Island: Super Mario Advance 3, Huffin Puffins are always in a group of one parent and a couple of juveniles. If Yoshi hits the mother, she will run in the opposite direction, and Yoshi is able to take the children. They act the same as Eggs, so Yoshi can pick them up by walking into them. If Yoshi loses one, he can return to the area where the mother is walking to claim more. Sometimes if the Huffin Puffin chick throw is canceled, they attempt to run away. The artwork depicts them with brown feet, while the in-game sprite depicts them with light blue feet. The young ones are extremely useful, as when Yoshi throws one, it circles about in boomerang fashion, eventually returning. It can only hit a surface three times, any more and it falls off the screen. 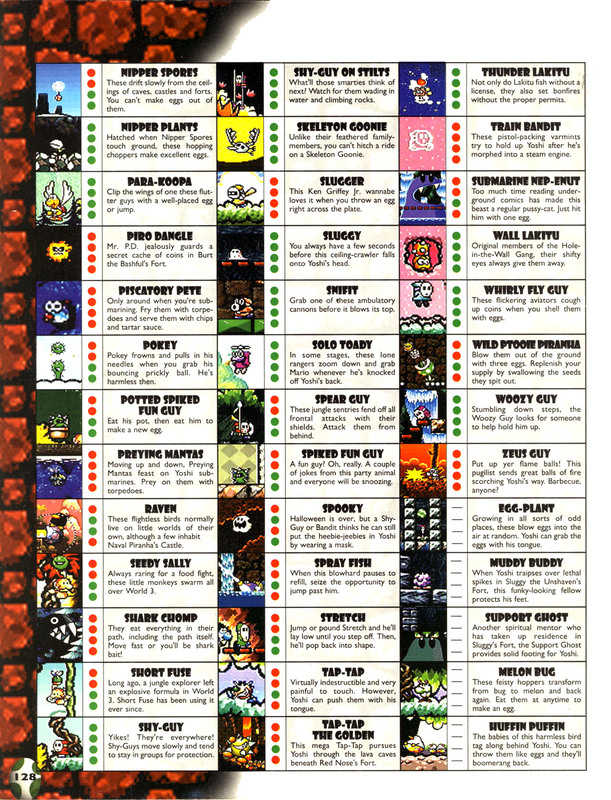 When Yoshi jumps through the goal at the end of the level, the puffin kids will fly away. The Huffin Puffin family returns in Yoshi's Story. They are only found in Stage 1-2: Surprise!! and Stage 3-4: Frustration. They act exactly like they did in Super Mario World 2: Yoshi's Island. The Baby Yoshis growl at the Huffin Puffin as if it were an enemy. This could be because they have never seen a Huffin Puffin and are not certain if they are friend or foe. In this game, their beak and buttons are orange, they have legs, and their feet are green. Relatives of the Huffin Puffin known as Fluffin' Puffins appear in Yoshi's Woolly World and Poochy & Yoshi's Woolly World. Unlike Huffin Puffins, the adult Fluffin' Puffin can be destroyed, while the chicks have been redesigned and no longer come back when thrown; instead, they create a fluffy, cloud-like platform that follows their movement. Huffin Puffin and its children make a small cameo in Mario Party Advance. In Bowser Lab, Bowser and Koopa Kid will ask the player what kind of opponent they want to face in a duel minigame, if the player chooses "A very scary monster," Huffin Puffin will appear out of nowhere, simply say "Huffin Puffin" and walk away. Bowser will then chastise the player and say next time they should just challenge "A scary monster". The game's end credits say Huffin Puffin disappeared and that not even Bowser knows where it went. French Cot, Cot From the onomatopoeia for a chicken clucking, "cot"
While the Japanese name of Huffin Puffins are based on species of ducks, the English name states them to be puffins. Additionally, they have been called chickens by Prima Games. ↑ "SuperMarioDude64". Mario Party Advance in-game cast reel. YouTube. Retrieved September 23, 2016. ↑ 3.0 3.1 Playing With Super Power: Nintendo Super NES Classics eGuide, Super Mario World 2: Yoshi’s Island Confidential Information Tab. This page was last edited on April 11, 2019, at 14:32.